It’s almost Spring and that means a refreshing start to your car’s cleanliness. Sure you probably got the exterior washed here and there in the past year but now is the perfect time to really get your car in sparkling condition. Here are some great Spring cleaning tips for your car. Your tires really take the most beating from water, salt, dirt, and overall poor road conditions. It’s time to show them some love. Give them a good scrub with a tire-cleaning spray and brush. For an extra thorough clean, remove the hubcaps and wash them. 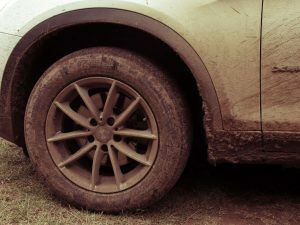 You should also take the time to wash out the wheel wells too. All of that same dirt that’s caked on your tires is also caked under your car’s body. Now is a great time to hose it off thoroughly. The car washes you’ve gotten over the course of the past year might have helped keep the exterior of your windows clean but they did nothing for the interior. Dust, dirt, and fingerprints have likely accumulated on all of your windows’ interior. Use a window cleaner to clean off both the inside and outside of your windows. Your car has likely been filled with all sorts of trash. We’re not calling you a hoarder, but if you don’t have loose receipts, coins, wrappers, and some other stuff littering your car we’d be shocked. Grab a garbage can and go through every section of your car to declutter. This includes the back seats, front seats, under the seats, trunk, and all of the compartments. Your car’s interior could use a good vacuuming after the winter. Thoroughly vacuum your seats and the floor mats. Remove those floor mats and vacuum the actual floor of your car, getting into every crevice possible. You can also take this opportunity to actually wash your car’s carpets with some water and mild soap. You don’t have to be a mechanic to know that the leaves that fall under your hood aren’t supposed to be there. Remove any debris your see and give the edges under the hood a good wipedown. Over time your console will collect a surprisingly thick layer of dust. You won’t notice it until you make your first wipe. Give your console and other harder interior surfaces a good dusting. We’re fairly sure you haven’t been keeping up with regularly waxing your car, so now is the perfect time to do it. This easy maintenance step will help protect your car during harsher weather.